Source: British Medical Association. Caring, supportive, collaborative? Doctors’ views on working in the NHS. November 2018. 1.51. We will continue to develop ICSs, building on the progress the NHS has already made. By April 2021 ICSs will cover the whole country, growing out of the current network of Sustainability and Transformation Partnerships (STPs). ICSs will have a key role in working with Local Authorities at ‘place’ level and through ICSs, commissioners will make shared decisions with providers on how to use resources, design services and improve population health (other than for a limited number of decisions that commissioners will need to continue to make independently, for example in relation to procurement and contract award). Every ICS will need streamlined commissioning arrangements to enable a single set of commissioning decisions at system level. This will typically involve a single CCG for each ICS area. CCGs will become leaner, more strategic organisations that support providers to partner with local government and other community organisations on population health, service redesign and Long Term Plan implementation. clinical leadership aligned around ICSs to create clear accountability to the ICS. Cancer Alliances will be made coterminous with one or more ICS, as will Clinical Senates and other clinical advisory bodies. ICSs and Health and Wellbeing Boards will also work closely together. 1.53. NHS Improvement will take a more proactive role in supporting collaborative approaches between trusts. We will support trusts that wish to explore formal mergers to embed these benefits, supported by a new fast-track approach to assessing proposed transactions involving trusts that have been accredited as ‘group’ leaders. Each ICS will be required to implement integral services that prevent avoidable hospitalisation and tackle the wider determinants of mental and physical ill-health. 1.54. Funding flows and contract reform will support the move to ICSs as set out in Chapters Six and Seven. Service integration can be delivered locally through collaborative arrangements between different providers, including local ‘alliance’ contracts. Another option is to give one lead provider responsibility for the integration of services for a population. A new Integrated Care Provider (ICP) contract will be made available for use from 2019, following public and provider consultation. It allows for the first time the contractual integration of primary medical services with other services, and creates greater flexibility to achieve full integration of care. We expect that ICP contracts would be held by public statutory providers. 1.55. A new ICS accountability and performance framework will consolidate the current amalgam of local accountability arrangements and provide a consistent and comparable set of performance measures. It will include a new ‘integration index’ developed jointly with patients groups and the voluntary sector which will measure from patient’s, carer’s and the public’s point of view, the extent to which the local health service and its partners are genuinely providing joined up, personalised and anticipatory care. 1.56. ICSs will agree system-wide objectives with the relevant NHS England/NHS Improvement regional director and be accountable for their performance against these objectives. This will be a combination of national and local priorities for care quality and health outcomes, reductions in inequalities, implementation of integrated care models and improvements in financial and operational performance. ICSs will then have the opportunity to earn greater authority as they develop and perform. 1.57. Both the wellbeing of older people and the pressures on the NHS are also linked to how well social care is functioning. When agreeing the NHS’ funding settlement the government therefore committed to ensure that adult social care funding is such that it does not impose any additional pressure on the NHS over the coming five years. That is basis on which the demand, activity and funding in this Long Term Plan have been assessed. Source: NHS England. Delayed Transfers of Care: Monthly Situation Reports. the model where the CCG and local authority ask the chief executive of NHS England to designate the council chief executive or director of adult social care as the CCG accountable officer. The government will set out further proposals for social care and health integration in the forthcoming Green Paper on adult social care. 1.59. In the meantime, the Better Care Fund (BCF) has provided an opportunity for councils and the NHS to work together to reduce delays, but is now in need of review. The BCF is regarded as a success in many areas, with local authorities and CCGs contributing more than their minimum required investment to support integration. However the National Audit Office has reported that the funding mechanism is overly complex, and there is a lack of clarity on the return from investment. The funding has also sometimes been used to replace core council funding rather than add to investment at the interface between health and care services. The Department of Health and Social Care and the Ministry of Housing, Communities and Local Government with NHS England are therefore reviewing the BCF to ensure it meets its goals. 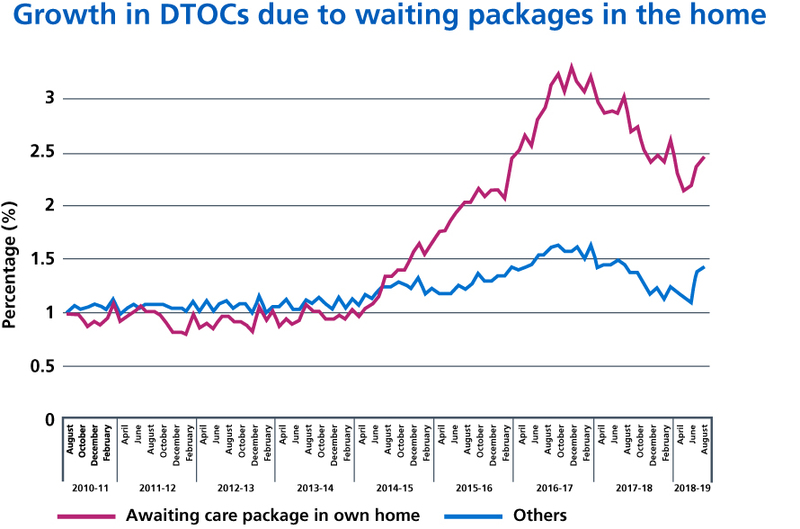 The review will conclude in early 2019, and 2019/20 will continue to include clear requirements to continue to reduce DTOCs and improve the availability of care packages for patients ready to leave hospital. 1.60. Chapter Two now sets out the action we – the NHS, will be taking specifically on prevention and inequalities.